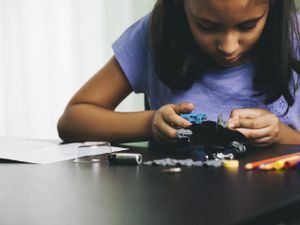 Genius hour is a great way to allow students to drive their own personalized instruction but where to begin such a big project? There are a lot of resources out there already, and most of the teachers that are embarking on this process are willing to share what they have or help you problem solve. Face to Face time is invaluable: While the students are working independently you are still there helping them focus and problem solve. The relationships you build with them come into play here. You will be using that genius hour time to work with them, conference with them, and help them reflect on where they are at in the process. Let Go: You have to learn to let go of the process at a certain point and be fine with letting the kids work at their own pace. Some get stuck in parts and take awhile to get over the hump; while others are zooming ahead. Think about your benchmarks: How do you want your students to show their mastery of their essential question? For me I had certain items due along the way to keep them on task. A video pitch, an interview, a book to guide their research, and finally a TED style talk to their peers. To grade or not to grade? Some people don't agree with grading this project. They want this to be a project that emphasizes the love of learning. I do grade it. Where do you fall in the spectrum? Utilize your own social network: Use Facebook, Twitter, Google+ to find mentors and/or people to help with interviews. Reflect: Constantly reflect on the process. What is working with your students, what isn't? Not all genius hours will look the same, and I think that is ok. It is about the engagement and creativity for your kids.